We are manufacturer and exporter of Silver Plated and Sterling Silver Gifts. any item as per buyer's specifications can be given shape to perfection by our expert artisans who are experienced in this trade only. We have products like Tray Set with Bowls, Napkin Rings, Baby Cups, Letter Openers, Egg Cups, Golf Tees, Book Marks. Child Cans, Candle Stands, Candle Holders, Bread Baskets, Flower Vase and many more items of interest. All our silver products are sold in U.K. with British Hallmark. 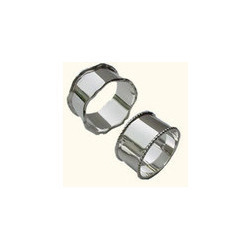 We offers Silver Plated Napkin Ring, designer silver napkin rings and silver plated napkin rings. Also offers brass napkin rings. We are offering customized products. 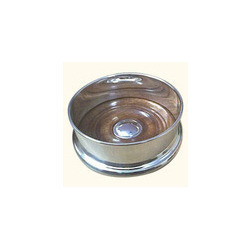 Silver Plated Wine Coaster with wooden base. Made with Brass metal which is silver plated and then fitted with specially seasoned wood. A nice gift for all wine lovers. Available in 2 sizes for wine bottle 3.5 inches diameter and champagne bottle with 5inches diameter. Also available in sterling silver 92.5. We are offering customized products.